I'm craving a grilled cheese with bacon. - What is Kimberly reading now? I'm craving a grilled cheese with bacon. 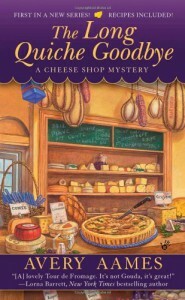 I like the setting of the cheese shop and this book made me want to find a local Fromagerie for some new cheeses for fall. The town sounds nice with it's mix of shops and shop owners. Kind of like a Richard Scarry Busytown. I know this was the first book in this series, but I felt like I was dropped in at the middle of it. I found myself confused at who the women were because there were so many female characters that had something to do with what was going on. I think it took me quite a few chapters to figure out that Charlotte was the main character. And what was up with Rebecca and all the crime shows? I know you just left your community, but really? You watched that much television in that amount of time? Despite trying to figure out who was who let alone trying to figure out who the killer was, I found myself wanting to read the next book to see what the mystery is with Jackie and Jordan.